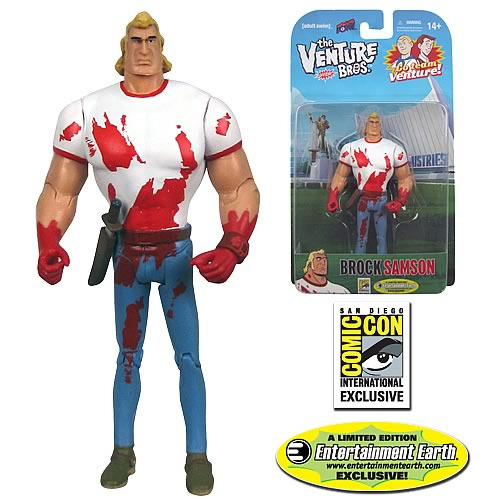 Never-before-made 3 3/4-inch Brock Samson Action Figure! Exclusive based on Adult Swim's animated series The Venture Bros. This secret agent features 10 points of articulation and a knife accessory. You'll want every one of these fan-demanded Venture Bros. action figures! Entertainment Earth Comic-Con Exclusive! Never-before-made 3 3/4-inch scale Brock Samson Action Figure! This macho secret agent is conspiring to get into your home and your The Venture Bros. collection. Posing as an irresistible articulated action figure from Bif Bang Pow!, Brock Samson stands 5-inches tall in all his bloody machismo glory, ready for his next action. (He brings a knife accessory, just in case.) Add him to your desk today! Limited edition of 1,500 pieces. Student of the great Hunter Gathers, former member of the OSI, and current member of SPHINX - Brock Samson is one bad dude. Trained to fight sharks, kill bears, and bed superspy ladies from all over the planet, there's no better baby sitter in the world. Seriously, that's a big part of his job! Bif Bang Pow! presents a truly awesome array of never-before-made 3 3/4-inch scale action figures based on Adult Swim's extremely popular animated series The Venture Bros. These fan-demanded figures are crafted of PVC plastic, feature 10 points of articulation, and come with character-specific accessories. You'll want every one of them in your toy box or Venture Bros. collection. Ages 14 and up.